Premier League sides Arsenal and Manchester United are keeping close tabs on Lille defensive midfielder Rio Mavuba according to Express. The duo English sides have been in serious problems with their defense since the start of this campaign. Arsenal boss Arsene Wenger has been eyeing many midfielders who can help the defensive line from the midfield. Real Madrid star man Sami Khedira and Southampton midfielder Morgan Schneiderlin are the two top names linked with the north London side. While reports have claimed that Manchester United new boss Louis van Gaal is looking to seal the deal for the France international for a cheap price in January. Rio Mavuba has been a regular player for the French side since his move from Villarreal in 2008. 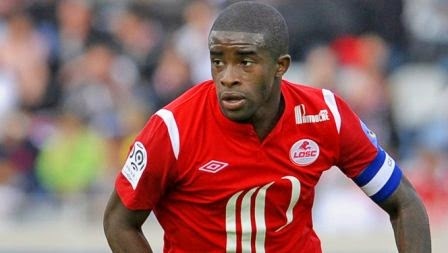 He has made 208 appearances for Lille in Ligue one. The 30-year-old Frenchman has been in fine form this term. He has made 1.9 successful tackles per game and has committed only 0.8 foul per game. Mavuba who is sepnding his eight season in France played a vital role in their return to European football. He has won a Ligue one trophy and a Coupe de France trophy in 2011.